Because our research is focused on understanding the underlying mechanisms for their population trends, we must live-capture and release individual sea lions in order to collect physiological and health samples, to permanently mark them and track some of them using telemetry instruments. Most of the 746 juvenile sea lions ADF&G handled between 1998 and 2009 were captured using the ‘dive-capture’ technique, a method pioneered by our program and refined continuously through the present. Because personnel are not required to land on the haulout, this method minimizes disturbance and thus permits multiple capture attempts at the same site. This method takes advantage of the natural curiosity and playfulness shown by sea lions in the water near their haulouts. Interestingly, the dive capture is most effective in southeastern Alaska and becomes more difficult to use in the western population, where sea lions appear to be more wary, sparse and prone to spook when divers approach. Depending on the size of sea lions targeted and sea conditions at the capture site, this method requires a capture skiff crew of 4-6 persons and dive crew of 2-3 divers and 2-3 tenders. The following photos illustrate a capture made on April 4, 2008 at Glacier Island, Prince William Sound. We use a specially-constructed line to capture sea lions using the underwater dive capture technique. A loop fitted with a safety stop and corrodible link is placed over the sea lion’s head. A 50 foot floating line trails the sea lion and terminates in two floats. Divers are deployed at a safe location near the haulout by a dive-tending skiff. The only responsibility of the dive skiff crew is to ensure the safety of divers during capture operations. When the divers are ready to begin captures, the capture skiff approaches them, throws the capture line to them, and backs away. 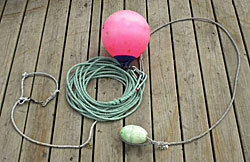 The capture line remains attached to the capture skiff by means of a large spool of floating line. Note the sea lions have not been flushed off the haulout by this activity. Two divers interact with sea lions underwater using the capture line and “bait” on a stick which entices them to enter the capture loop. After divers restrain a sea lion, it is brought toward the capture skiff using the capture line. Once alongside the skiff, the sea lion is wrapped into a strong vinyl-coated nylon blanket to restrain its movements and prepare for lifting. Once secured, the sea lion is pulled up out of the water using the blanket and rolled into a specially-constructed padded aluminum storage box. 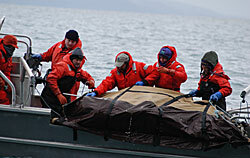 Once the box lid is attached, the capture line is removed from the sea lion and the crew prepares for additional captures or transport back to the research vessel for processing and release. Heath, R. B., R. Delong, V. Jameson, D. Bradley and T. Spraker. 1997. Isoflurane anesthesia in free ranging Steller sea lion pups. Journal of Wildlife Diseases 33(2): 206–210. King, J., T. Gelatt, G. Pendleton and K. Pitcher. 2007. A field-based method for estimating age in free-ranging juvenile Steller sea lions (Eumetopias jubatus). Marine Mammal Science. 23(2): 262–271. McAllister, D. C. 1997. A dive report for a Steller sea lion capture method development project. 29 January – 8 March 1997. Anchorage, Alaska: Division of Wildlife Conservation, Alaska Department of Fish and Game.